JIM REEVES BOOK FOR 2019! 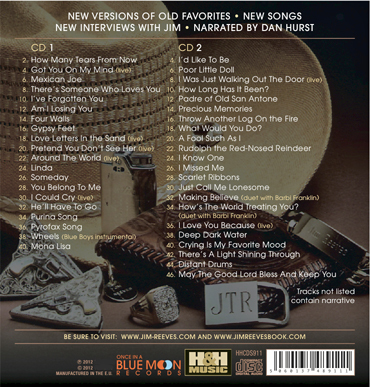 CD 1: How Many Tears From Now; Got You On My Mind; Mexican Joe; There's Someone Who Loves You; I've Forgotten You; Am I Losing You; Four Walls; Gypsy Feet; Love Letters In the Sand; Pretend You Don't See Her; Around the World; Linda; Someday; You Belong To Me; I Could Cry; He'll Have To Go; Purina Song; Pyrofax Song; Wheels; Mona Lisa. CD 2: I'd Like To Be; Poor Little Doll; I Was Just Walking Out the Door; How Long Has It Been; Padre of Old San Antone; Precious Memories; Throw Another Log On the Fire; What Would You Do? ; A Fool Such As I; Rudolph the Red-Nosed Reindeer; I Know One; I Missed Me; Scarlet Ribbons; Just Call Me Lonesome; Making Believe (duet with Barbi Franklin); How's the World Treating You (duet with Barbi Franklin); I Love You Because; Deep Dark Water; Crying Is My Favorite Mood; There's A Light Shining Through; Distant Drums; May the Good Lord Bless and Keep You. A total of 86 tracks, including narrative. Total run time 144 minutes. •The woman behind the man, and NO, it's NOT Mary. Revealed at last: the petite brunette who fell in love with Jim, who used her connections in showbiz to further his career, and who taught him how to sing on records. Jim hung out at her Hollywood hideaway, and wanted to leave his wife for her, but she actually saved the Reeves marriage. Then Mary sued her after Jim was gone! •What Jim did before a recording session (it's not what you think), and what he liked to do after (also surprising)...plus detailed accounts of his studio work, including interviews with many musicians. •The vision Jim had while driving alone late one night, which he interpreted to have heavenly significance and saved him from a washed-out road... How Jim became so afraid for his own safety after being mobbed by fans in South Africa he started even wanting security at the Opry...How Jim fended off three carnival workers who accosted him after a show, yet how his estate ultimately fell into the hands of a carney who ripped off Jim's widow for millions and almost destroyed Reeves' legacy. •Read Jim's own account of growing up, reflections on his career, the world of music, and what he planned for his future (including another album sung in a foreign language). •What Jim REALLY thought about his colleagues Chet Atkins, Eddy Arnold, Fabor Robison, Bill Anderson, Dottie West, Johnny Cash, Buck Owens, Marty Robbins, Roger Miller, Roy Clark, Elvis Presley and others. •Discover Jim's experimentation with the psychic realm...the premonitions he had about how he would die... •Read about the time Jim protected a little handicapped girl who was being harrassed... Learn how Jim was a veritable Pied Piper whom children adored... Also his heartache because he wanted a child of his own. •Learn about the night Jim and a ladyfriend had a tête-à-tête in Hank Williams' apartment...Find out what happened to the 1932 Buick Jim used to own. •Learn music industry secrets such as who REALLY wrote "We Thank Thee" and "Welcome To My World." •Read an interview with the young woman whom Jim wrote between recording sessions on July 2, 1964 and the plans he made to be with her... Also detailed is Mary's confrontation with this female at Jim's funeral. •How Jim saved Chet Atkins from a jealous husband...and how Jim fell head over heels in love with a woman in Europe... Learn why Jim couldn't play for civilian audiences in England. •Intriguing new info about Jim's foray into network radio...How Jim brought South African arranger Bill Walker to the U.S. (and put him on salary), because he planned to move his music into a "pop" direction and had accepted an offer to do a weekly network TV variety show to compete with Jimmy Dean! •What Jim did in Las Vegas on a night off... Hear about Jim's search for a ranch in Texas. •Find out what Jim liked to eat, his favorite foods, what he did to diet, what he liked to drink... Read about Jim's 1960 Cadillac Eldorado, plus see close-up photos of his diamond cluster ring. •Hear stories you've never heard before about Jim Reeves from Jean Shepherd, Hank Cochran, Harlan Howard, Little Jimmy Dickens, Elton John, Boots Randolph, Gilbert Gibson and many more. •Learn new details about Jim's genealogy (which has been misreported), the trouble Jim's father got into with the law, how Jim's mother, Beulah, said she had been married before she met Tom Reeves (Jim's dad), and why the true birth date of her first born son, Buford, suggests a cover-up. •What Jim did while flying Mary and him home from their last vacation that made her cry, and what she made him promise he'd never do again. (But he broke that promise with fatal consequences). •How Jim spent his last weeks, his last weekend, his last night, his last day...The man he called from Batesville the night before...The person Jim and Dean stopped to see on their way to the airport who, if he had been there, would have changed the timetable of their flight and kept them alive...The one small indulgence Jim and Dean enjoyed before taking off on their ill-fated flight home. •Read the gripping, minute-by-minute account of what led up to the plane crash, including the final tragic moments of the flight, with vital new details culled from the long-elusive accident report, along with an eyewitness to the crash who was never interviewed by authorities. Also explored are the mysteries surrounding the search efforts and how the FBI investigated links to organized crime, the briefcase authorities were frantic to find at the crash site, and what the scene looked like, as revealed by a 10-minute color home movie never known to exist but obtained by the author. •Also read the tragic story of Mary's decline, how she was betrayed by people close to her, and the Reeves family member who is still trying to exact revenge on her for not making him a star!